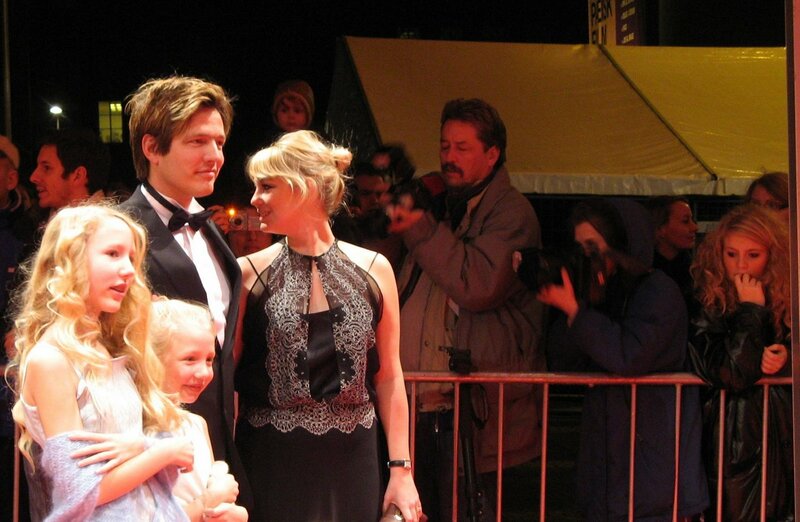 Thomas Vinterberg (Festen‘s director and one of the dogma founders) and family. The girl in the right thinks: Where the heck are the stars? Around 6pm the first guests started to come, an annonymous crowd usually dressed in the most terrible fashion (think boots in a gala event), but the funniest was to notice those types who seem to find themselves so important for doing a 12 seconds walk in a red carpet. By my side, two young women in their bikes took a good look and said “What a boring red carpet!”, and then left. Later a guy with a huge dog stopped by and more women with their babies (!). The place was still nearly empty, and I asked myself if one would have had a similar picture in another city, but CPH. I guess not. By the end, it looked like 50 people or less watched the red carpet, it was definitely the saddest red carpet ever made. Lack of interest? Not enough publicity, perhaps? Both? Lack of real movie stars? Neither James McAvoy nor Kristin Scott Thomas, both nominated, appeared. The only real celebrity was Dame Judi Dench, as I can’t count danish actors and directors like Paprika Steen (who plays the sister in Festen) and Mads Mikkelsen (the villain in Cassino Royale and the lead actor in After the Wedding) as big celebrities, among others. Besides knowing a bunch of directors by their names, films they made, I just don’t know what they look like (do you?). Wim Wenders, filmmaker and president of the film academy, walked by three times, and I only realized who he actually was when he was standing with a bouquet of flowers, waiting for the very late crown princess Mary. A group of spanish people walked by, possibly the ones behind El Orfanato? What about a short italian guy, would he possibly be Gomorra‘s director? I had no idea, and frankly, I didn’t give a damn. The only director I really wanted to see was Lars von Trier, but as expected, he didn’t bother walking through the red carpet. Around 8pm, the pre-event was over, no glamorous gowns and red lipstick, no screaming fans, no warmth, no life, as an ordinary dark and depressing winter evening, with the exception of a couple of searchlights that illuminated the sky, playful.